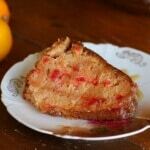 This moist, tender bundt cake is studded with maraschino cherries and soaked in bourbon and citrus for a unique, adult dessert. Preheat oven to 350F and spray or butter a nonstick bundt pan. Coat the inside of the bundt pan with a light coating of sugar. Coarsely chop the Maraschino cherries - I usually just pulse them in a food processor. Add sugars and blend well. Blend in the bourbon, orange juice, and 2 tablespoons juice from the lemons. Add flour mixture and blend well being careful not to over beat the batter. Add zest and cherries -- fold in. Spoon into a bundt pan and bake for 1 hour and 50 minutes or until done. When the cake is almost done melt the 1/2 cup of butter in a saucepan. Stir in the sugars and the bourbon. Simmer, stirring, until the sugar crystals dissolve. Let simmer about 2 more minutes - mixture will be a thin syrup. As soon as the cake comes out of the oven poke holes in it. Carefully spoon 2/3 of the syrup over the cake allowing it to soak in. Carefully turn the cake out on a cake dish and brush the top and sides with the remaining syrup.